Holy moly do I love ramen. And, by the way, I’m not talking about the “Peel off the lid. Pour boiling water into the cup. Let sit for three minutes. Stir well and serve” variety. I’m talking about huge bowls of chewy, luxurious noodles swimming in a flavorful, savory broth with an assortment of proteins, loads of garnishes, and a soft- boiled egg floating on top. Comfort food of the highest order. In winter (or anytime I’m not feeling well), nothing soothes quite like a bowl of ramen, but it’s not always possible to get my hands on the real McCoy. And while making flavorful Japanese- inspired soup at home isn’t difficult, subbing in regular pasta for ramen noodles just doesn’t do the dish justice. 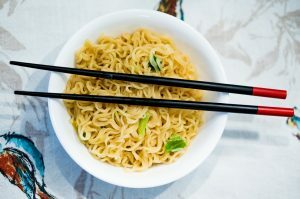 Ramen noodles have a springier, stronger texture than other styles of pasta and a distinct savory taste in the dough that comes from an alkaline element known as kansui. 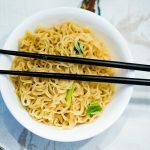 It isn’t easy for most home cooks to find and— let’s be honest— you’re probably not going to make your own ramen noodles even if you could. BUT what other alkaline element do you love so very, very much because it can do absolutely anything, including making regular spaghetti look and taste a whole lot like authentic ramen noodles? BAKING SODA!!! (Sparkles! Rainbows! Yaaaay!) This hack is quick and satisfying. No Styrofoam cup required. 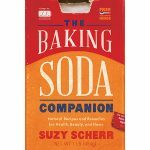 Excerpted from The Baking Soda Companion © 2018 Suzy Scherr. Published by The Countryman Press, a division of W.W. Norton & Company. 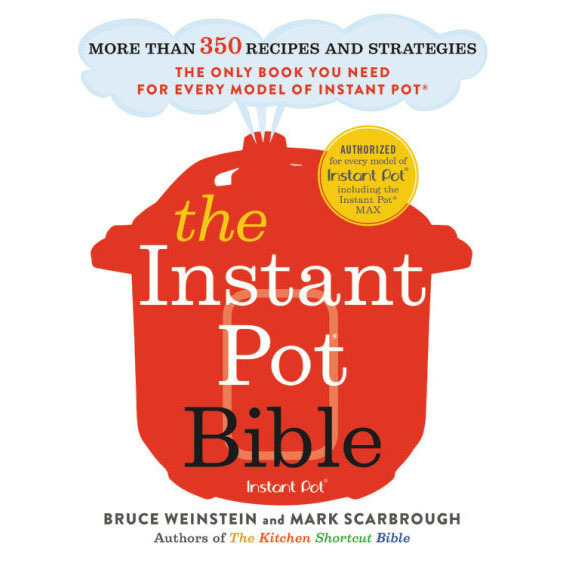 Bring water to a boil in a large pot over high heat. Slowly add 1 tablespoon of baking soda for each quart of water. The water will still bubble and foam, so make sure that you keep a close eye on it. Add the spaghetti to the pot and cook 8 to 10 minutes, until al dente, springy, and yellow. Drain, add to soup or broth of your choice, slurp, and enjoy.